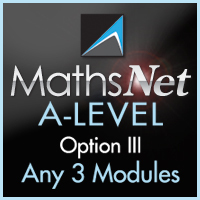 Get coverage of any 3 modules from the AQA syllabus for £10 + vat. Click the orange heading above to progress to select your choice of modules. Get coverage of any 3 modules from the CCEA syllabus for £10 + vat. Click the orange heading above to progress to select your choice of modules. Get coverage of any 3 modules from the Excel syllabus for £10 + vat. Click the orange heading above to progress to select your choice of modules. Get coverage of any 3 modules from the OCR syllabus for £10 + vat. Click the orange heading above to progress to select your choice of modules. Get coverage of any 3 modules from the OCR-MEI syllabus for £10 + vat. Click the orange heading above to progress to select your choice of modules. Get coverage of any 3 modules from the WJEC syllabus for £10 + vat. Click the orange heading above to progress to select your choice of modules.